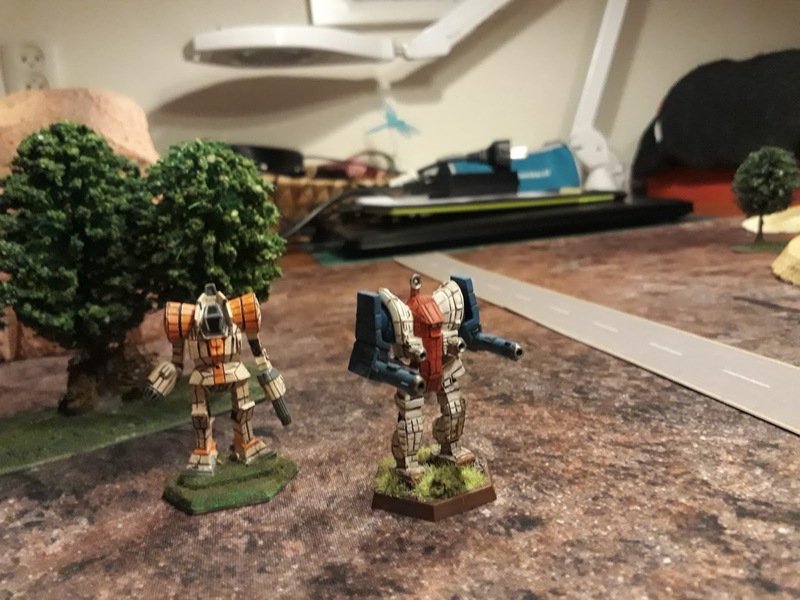 Sometime halfway the 90ies I came upon the boardgame Battletech by FASA. Having gotten some taste of Robotech this game of big robots stomping around and hurling laserbeams and missiles all over the place immediately caught my fancy. I bought the 1992 edition, found other players (and a friend for life) and played it absolutely to bits. On the printed maps at first, on the tabletop in later years. Over the years the interest waned, other games came along, my friend passed away and the Mechs gathered dust in their boxes. Until one day a friend of mine got caught with the Giant Stompy Robot Bug and began inquiring which rulesets would be suitable. Eventually we ended up with Batletech Alpha Strike (BTAS). Huh? What was that? It turned out that during the 15+ years I had looked the other way Battletech had had quite an evolution. There were several new editions, IP transferred from collapsing FASA to a German company and then somehow back again to a new US company. There emerged a Quick Play Battletech that seems to have developed into BTAS. Same Mechs. A lot more of the same Mechs actually, as BTAS was supposed to be a Big Battle Ruleset! But different rules. So I acquired them to look them in the eye up close and try them. It was a different beast indeed. Since I had trouble myself finding a coherent and clear review of the game compared to Classic Battetech I thought I would do at least someone a service by writing one myself. I will not go into the enormous amount of fluff published, the video games, the spinoffs, the Unseen and other exotics, but will instead concentrate on the game mechanics of the two most dissimilar incarnations: CBT en BTAS. BattleTech is a wargaming and military science fiction franchise launched by FASA Corporation in 1984, acquired by WizKids in 2001, and owned since 2003 by Topps. 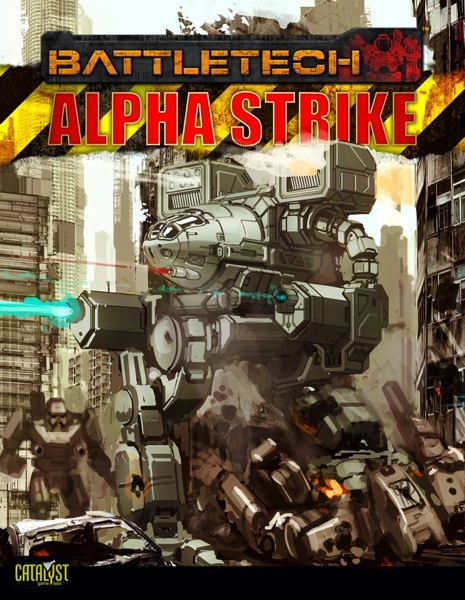 The series began with FASA’s debut of the board game BattleTech (originally named BattleDroids) by Jordan Weisman and L. Ross Babcock III and has since grown to include numerous expansions to the original game, several board games, role playing games, video games, a collectible card game, a series of more than 100 novels, and an animated television series. So CBT is 35 years old this year. 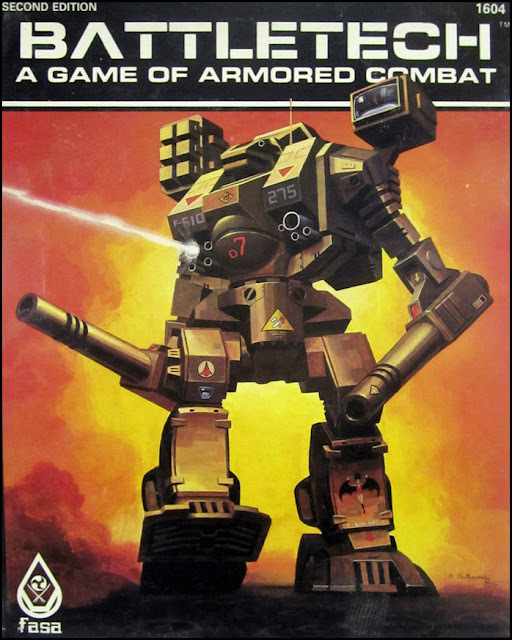 Let’s take the 3rd edition from way back in 1992 as a good example of the Original Classic Battletech. It was quite similar to the original Battledroids game and gives a good impression of a boardgame from the 80ies/early 90ies. CBT board- or tabletop game? Officially CBT was a boardgame, played with miniatures on a hex map with terrain printed on it. The 3rd edition (or to be precise the 1995 Battletech Compendium that wrapped up the 3rd edition) contained a tabletop conversion chapter that was quite straightforward. All distances, ranges and speeds were converted from hexes to 2″ per hex. 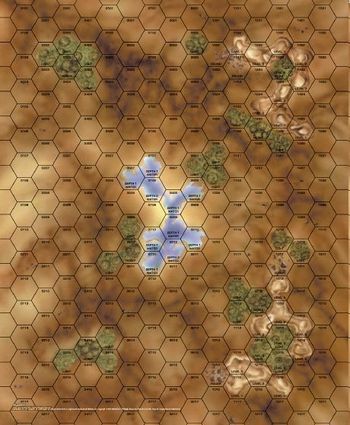 Terrain came in standardized height levels and of course was required to replace the printed maps.. Other than that, playing CBT on a tabletop was basically the same game as that played on the map. Only better-looking. CBT is a turn-based game in which units move and fire alternately. The turn officially has several phases: Move, Reaction, Shooting, Combat (physical melee), Heat Phase and End Phase (things blow up and shut down and such). All are taken in the order of Initiative, determined by a D6 roll. The winner moves and fires last (although fire is supposed to be simultaneous and any consequences happen simultaneously as well). CBT is a very layered game. The player can make a lot of choices, all with their respective pros and cons. For this you must know that all actions a Battlemech (one of those Big Stompy Robots) can take cause heat because of the energy use powered by the ‘Mechs fusion reactor. Mechs can only vent so much heat in a turn and excess heat can have dire consequences. Damage suffered can enhance heat effects. Standing in water helps cooling down faster. So choices must be made wisely. 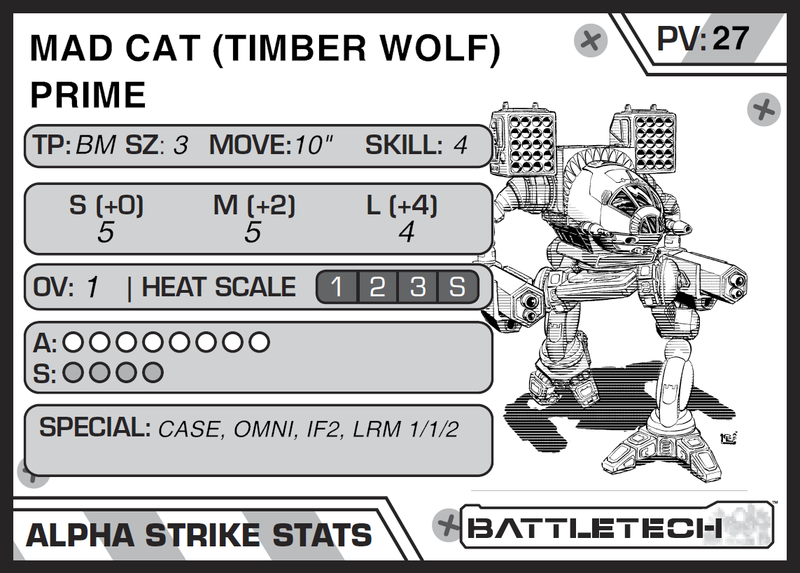 On top of that Mechs are equipped with a wide array of weapons for various ranges. Few weapons function well at all ranges. Ammo using weapons cause less heat than energy weapons for about the same damage, but of course ammo bins may explode when hit, which is usually enough to obliterate a Mech entirely. Finally, speed is a factor. The faster you move, the harder it is to hit something with your weapons. But also it becomes harder to hit YOU. So maneuvering has an important function in the game. Shooting is a complicated affair. You roll 2D6 against the pilot’s Gun Skill (usually 4) plus your own movement plus your targets movement plus incidental cover plus the effects of range on the weapon you are firing. And all this for EACH weapon you want to fire. For physical melee all this is repeated sans the range modifiers. You can ram, kick or punch your opponent or simply jump on top of him. Great fun all around. Mechs have a complicated construction. They are built up around an interior construction (Internal Structure or IS) that carries all equipment, reactors, engines, weapons and other stuff and is covered in Armor from head to toe. A Mech has 8 Hit Locations at the front and another 3 on his torso at the back. 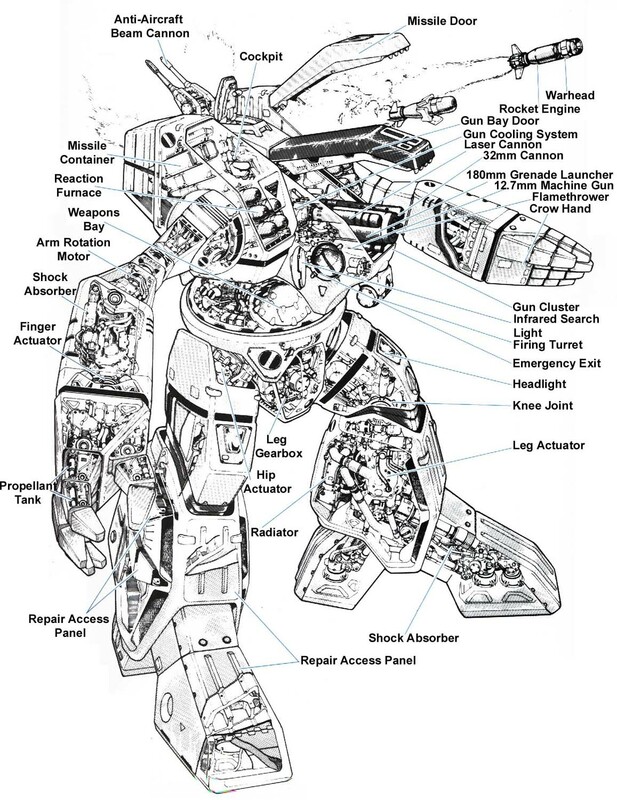 A CBT Mech diagram: this is only 1 Mech…. A Hit is then scored on the frontal, left, right or rear of the target and hits a randomy determined location. It might only cause loss of Armor, but once the Armor is breached, the IS suffers and the chance to score Critical Hits on bits of weapon, ammo or equipment appears. In turn this has all kinds of effects on the Mech’s functioning. This way Mechs can be gradually worn down or explode in a blast of ammo or fusion energy depending on the Critical hit effects. So CBT is not an easy game to either play or master. Lots of things have to be taken into account before deciding how to move and what to do with all those awesome guns and missiles. To play CBT you need to cram A LOT of information into your head. The available equipment and weaponry has lots of intricate detail that separates it from the other weapons and equipment. Of the dozens and dozens of available Mech designs no two are the same or even comparable. Many are designed with a specific tactical purpose in mind. Lightning-fast 20-ton scout Mechs are no match for hulking 100-ton Assault Mechs in a toe-to-toe fight but when the goal of the mission is speed this might not help the 100-tonner much….. But this is also why I love this game so much. The player constantly has to balance actions versus consequences to remain a difficult target to hit while hitting his own targets at the same time and still be able to keep functioning in the next turn. It is a very challenging game in that respect. Published in 2013 BTAS catered to the critics that thought CBT was way too slow to be enjoyable and wanted lots of Mechs on the table without having to share an appartment for a week…. The designers decided to turn BTAS into a tabletop wargame instead of a boardgame. Like I explained above, this did not in itself matter much to the actual gameplay. It just looked better. Neither did the basic mechanics of CBT change much in BTAS. There were still turns, Initiative, Shoot and Combat phases et cetera. But then BTAS made some daring choices to speed up the game. First all the separate weapons on a Mech were clustered together in three groups based on range. So a Mech would do 4 damage at Short Range, 3 at Medium Range and 0 at Long range for example. A salvo is now just one 2D6 roll. Weapons also do not have a specific location on a Mech anymore. All weapons fire forward and directly sideways. The rear 180 degrees has become a blind spot. Second the Heat effects were dismissed, Mechs would now only heat up when the player willfully chose to Overheat while shooting (and do extra damage). Simply moving and firing did not have any Heat consequences anymore. Heat is virtually gone as a tactically relevant factor, unless specifically chosen to be one. Third the separate hit locations were cancelled and replaced by one: the entire Mech. IS and Armor are still there, but scoring hits on IS now only causes a roll on the Critical Hit table to see what happened. No more rolls to see where you hit. Just cross off the damage. Lastly the effects on the Mech’s own speed were dismissed and the effects of the target’s speed are now limited to three situations: Immobile (after a shutdown), Standing (practically) still and At Speed (for which only the available speed is relevant, not the actual one). 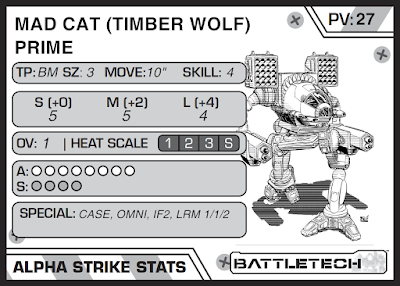 An BTAS Mech card: smaller than the CBT Critical Hit locations alone…. These four major changes enabled the game to move at least 3 to 4 times faster than CBT. Fielding Companies of 12 Mechs per player is now possible in an evening’s game. Day-long games could now handle Battallion strength forces. Huge tables with dozens of Mechs appeared in games offering spectacular visual appeal! And indeed BTAS is a very quick-playing game that is easy to learn and also a lot easier to master than CBT. This is also the price for BTAS’ speed. Players’ choices are now limited to “Where do I move to get a shot in, preferably from some cover?” and “Do I overheat ?” Where Mechs in CBT usually took many turns to get destroyed in BTAS a Mech can be obliterated in one. Retreat is not an option anymore, because the loser is usually destroyed before he can even reach the edge of the table. Initiative advantage is all-powerful since it enables you to slip behind a opponent and fire at him with impunity. 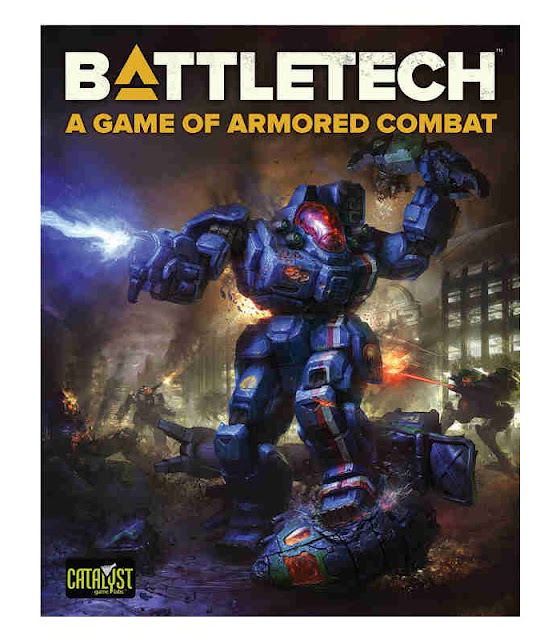 This is supposed to be the Modern Classic Battletech game. Published in 2019 my pre-order is still floating somewhere on the Atlantic but a mate lent me his copy so here is the review of BTaGoAC (haha). BT19 (as I shall call it in this review) has benefited greatly from modern layout and graphic design. It is a clear-written full colour softcover booklet of 48 pages. 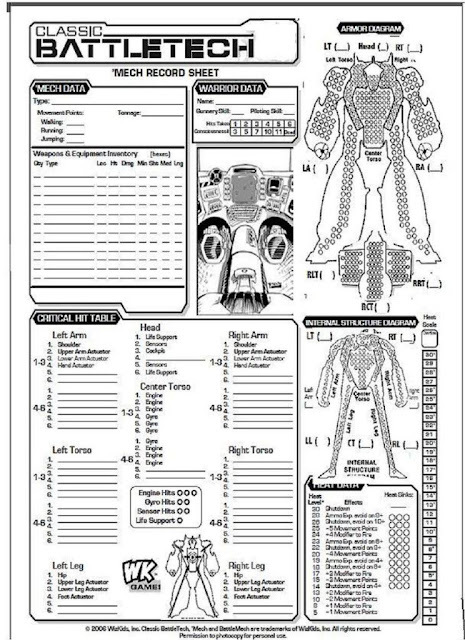 The book contains the rules for the boxed game in its entirety so far as Mechs are concerned, up to and including designing your own Mechs. .
Rules for vehicles, Aerospace units and infantry have to be found elsewhere (presumably in the Total War Compendium). This is consistent with CBT which also offered a Compendium fur the complete rules including CityTech, Aerotech and all kinds of innovative and experimental equipment and weapons. The rules are virtually indistinguishable from CBT. There are a few minor differences. The Reaction Phase is gone. Torso twisting (to move part of your field of fire into your, left, right or rear) has now been incorporated into the Combat Phase and the fire sequence. Funny thing is this is exactly how we used to play it as we did away with the Reaction Phase immediately. Obviously the redesigners felt the same. Movement dice (dice that indicate the Mech’s movement modifier after moving) have found their way into the rules. This too is how we used them in the 1995 edition. I might have overlooked something, but even so, it is clear that BT19 is virtually the same game as CBT. So everything detailed above and below about CBT applies to BT19. As I am quite fond of CBT I have little to complain about BT19. Still I feel that the opportunity could have been seized to simplify the Mech Data sheets. However, when people have been using them for 30 years, maybe I am just too demanding….. It has become clear to me that CBT and BTAS, although on the tabletop they may appear virtually the same to the naked eye, are two vastly different games. BTAS is a low-treshold quick game that can be easily picked up and applied to lots of terrain and miniatures in relatively short amounts of time to produce a relatively straightforward game. It would put it a bit strongly to call it a beer-and-pretzel game but it comes close. CBT on the other hand is a slow and complex game in comparison, does however offer many tactical dillemmas and choices and with that a much more challenging game. In theory both rulesets could be used in the same Campaign to play engagements of various sizes. One needs to realize however that the casualty rate in BTAS is so high it might derail the Campaign altogether. Of course fans and players have tried to upgrade BTAS’ complexity and to slow down it less desirable consequences. The BTAS Companion book even offers official rules for this purpose. Ironically most rule adaptations hark back to the CBT rules, like re-introducing Target Speed Modifiers from CBT. So know that CBT and BTAS are two very different games that offer very different kinds of enjoyment. The answer to the question: “Should I play CBT or BTAS?” is not dependent on which game is better, but what you want to get out of it.